Sunday evening, and boy am I beat. 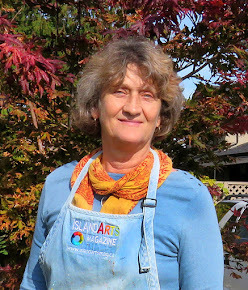 Yesterday was my art opening at the Rollin' Art Centre in Port Alberni. First of all, the show looked absolutely beautiful! The ladies who set it up did a great job. Here is a picture of the entrance .... as you come up the stairs the first thing you see is a couple of prairie cows. 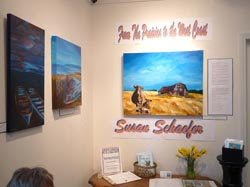 The title of the show is "From the Prairies to the West Coast." I have 38 pieces on display - all acrylic artwork - of varying sizes. 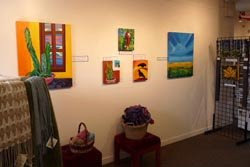 The pieces were displayed in different groupings, with themes. I was really happy with the look. For three hours I painted and talked to art lovers about my work. The biggest surprise was when Shaw Cable showed up to do an interview with me that will appear on television this week. The local newspaper showed up shortly after that, to write a story about the show. Wow! What a great day! I had difficulty sleeping last night, as I was on cloud nine, reliving the day. By the way .... the the cakes and brownies that they served were decadent! The show continues on till May 20th... make sure you to drop by, it's well worth the drive!